Doesn’t he look awful? I was glad he did this for me no matter how bad he felt. 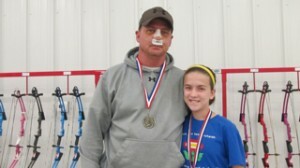 This week, the funny picture is when my stepdad and me won the Shannon Trail Spring team competition. This is when my stepdad had a broken nose. The reason that he a broken nose is that he had a surgery to help him sleep better. We drew a mustache on his bandage with a Sharpie. I thought that was really funny. When we walked into the door everybody was asking, “You’re seriously going to do this with a broken nose?” After all of that we started to shoot and we were shooting good too, most in the yellow, occasionally one in the red or blue but not a lot. When we got done and totaled our scores then we handed them in. After a couple of hours they started announcing the awards, we were the third group to be called and we won first!